Wow, I think it’s been a really long time since I’ve done an Easter post. I wasn’t even planning on doing one this year, but my mother-in-law gave me an Easter chocolate mold. 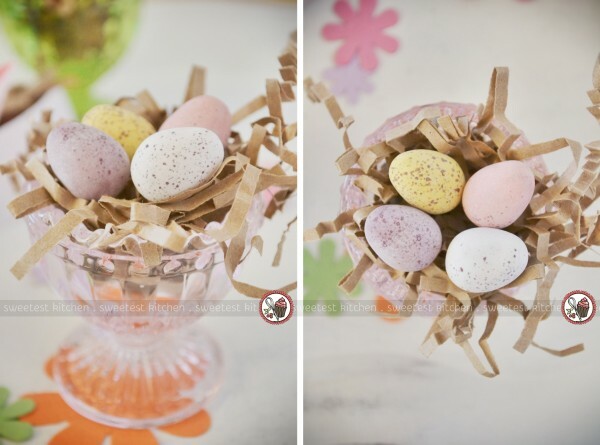 And that’s pretty much the end of that, as you must know I suddenly couldn’t resist making chocolate eggs! I planned on making solid chocolates, peanut butter-filled chocolates and caramel-filled chocolates. For the chocolate, I used high-quality chocolate with a cocoa content of 45%. For the peanut butter filling, I always use Minimalist Baker’s recipe, which is found here. For the caramel filling, I used store-bought caramel spread, which was essentially a thin dulce de leche type of caramel. If you want to make your own caramel, go for it! Now, making chocolates like this is really, really quick and easy; within 30-45 minutes, depending on how quick of a worker you are, these can be ready to eat. I chopped my chocolate really finely so it would melt quickly. I set an inch of water in a small saucepan to boil, and once it started bubbling, I turned it down to the extreme lowest temperature (it could not go any lower without being turned off!). I set the bowl of chopped chocolate on top, and let it sit for a minute to start melting. Then I continually stirred the chocolate until it was sort of half melted. I removed the bowl from the pan and kept stirring until it was mostly melted. I still had some tiny chunks left, so I set the bowl back on the pan for a few seconds, while stirring, then removed it again and kept stirring. All melted! The trick being to keep the already tempered chocolate in its temper by not letting it go above 90F. I think I was just lucky, as I said I have no thermometer so I had to guess and stir the heck out of the chocolate while it was melting at such a low temperature. Oh, and there is a science to the whole tempered chocolate thing and lots of good info about it at bakingbites if you’d like to read what it all means. I then spooned the chocolate into the molds, spreading it up the sides to cover the surface of the mold, then placed the molds in the freezer. I should note that I already had the peanut butter filling prepared, so all I had to do was grab chunks of the filling and push it into the hardened chocolate. For the caramel, all I needed to do was spoon the caramel from the jar into the chocolate molds. Tip – don’t let the fillings come to the top of the mold, but rather just below, to allow room for the last layer of chocolate to cover it up. For the solid chocolate, well, I just simply poured the chocolate into the molds to the top. I used a bench scraper to scrape off the excess chocolate from the top of the mold, which was to try to get a clean edge. Once the chocolate molds were filled with the filling ingredients, I had to remelt my chocolate a little bit. This only took less than a minute when I placed the bowl back on the pan of hot water. Then, all that was left to do was cover up the peanut butter and caramel fillings, ensuring that it was completely covered. I let the molds set in the refrigerator while I hung some clothes up on the clothesline. All the while, I was wondering if the tempering method I used really worked. I was pretty sure it had, as the utensils I was using had hardened chocolate on it which dried quickly and didn’t start melting when I touched it. It was an excruciating wait! 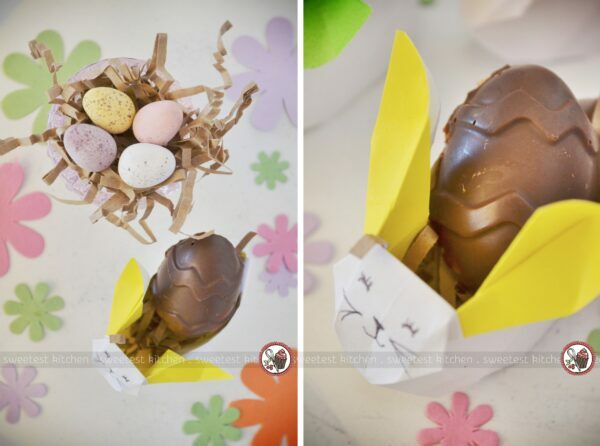 Before I tell you the results, I’ll share with you how to make these super cute origami bunny baskets. I love origami! 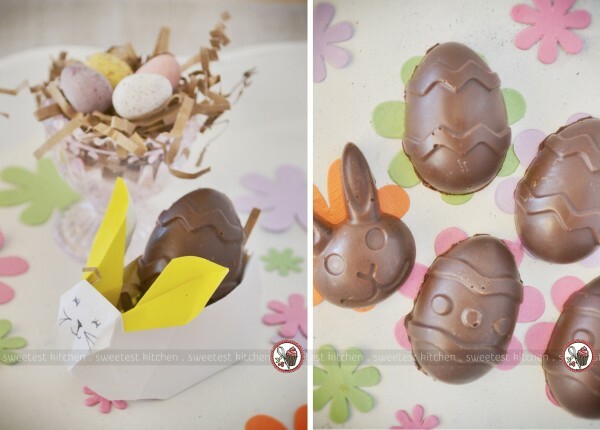 So when I saw these bunny baskets, I knew I had to use them for my chocolates. There is an excellent video at Origami Spirit with super easy-to-follow instructions, which I highly recommend watching so that you can make your own bunny baskets. Okay, so how did my cheat’s method for tempering work out? It was successful! Although you can’t tell how glossy the chocolate in these photos, they are definitely glossy and most successful of all – it doesn’t melt as soon as you touch it. The chocolates are solid at room temperature and snap when you bite into them. This, my friends, is a fantastic and easy method for tempering chocolate and I’ll definitely be using it over and over again. Again, I’ll stress the important fact that you must not overheat the chocolate so that it won’t lose its temper. If you have a thermometer, use it. If not, just stir the heck out of the chocolate at an extremely low temperature over a pan of hot water, and don’t let it melt all the way over the water – take it off once it’s half melted and stir, stir, stir. – My mother-in-law gave me the silicone chocolate mold, which she got from Woolworth’s for free by spending a certain amount of money. I’m not sure if you can buy this particular mold from the store or online. – I used about 250g of chocolate with a cocoa content of 45%. Feel free to go darker, or use milk or white. I had 12 smallish molds to fill. 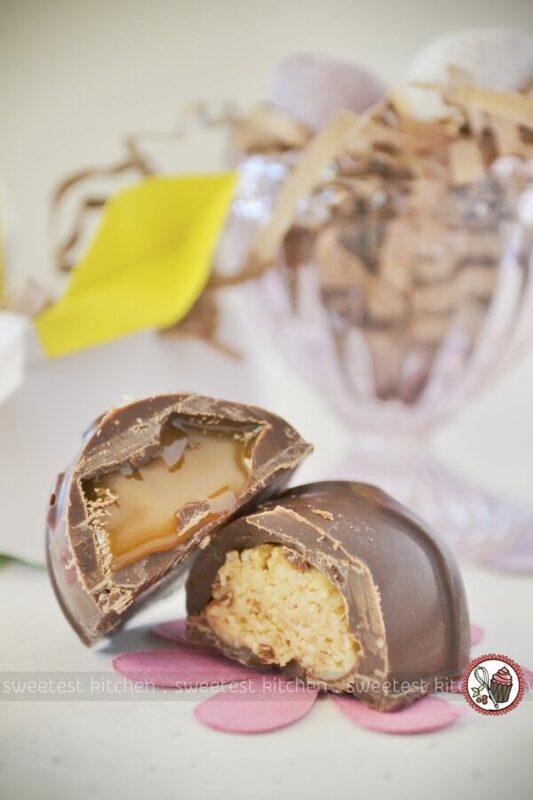 – The peanut butter filling recipe is vegan and the only pb filling I ever use for peanut butter chocolates. The recipe is at Minimalist Baker. – The caramel filling comes from a jar, and it is basically a thin dulce de leche spread. I used Bonne Marie brand. Feel free to use real dulce de leche or salted caramel, or make your own! – The method I used to temper my chocolate is a cheat’s method (inspiration from about.com) and uses chocolate that is already tempered (which is basically any chocolate block you can buy at the store). The trick is not to overheat the chocolate so that it stays tempered. Read above for an in-depth look at how I did it, but it involves chopping the chocolate really finely so it’ll melt quicker, setting it, in a bowl, over a pan of hot water that is on the lowest heat possible, stirring, and taking it off the heat when it’s half melted. Keep stirring and stirring until it’s all melted, or place it back on the heat for a few seconds at a time until any remaining chunks are melted. If you have a thermometer, don’t let the chocolate get over 90F. If you don’t have a thermometer, just be really careful. Once the last little chunks are melted, it’s ready to use. Work really quickly because tempered chocolate will set faster than just plain melted chocolate. Feel free to ask any questions, and until next time – have a Happy Easter!